The Aigialos Niche Residences & Suites, 5 stars, enjoys a quiet and peaceful location. 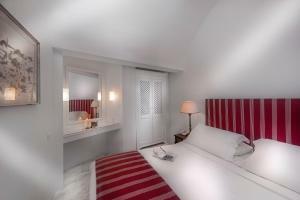 This luxury hotel overlooks the Aegean Sea and is located a short walk from the city center. For security reasons, children under the age of 6 can not be accommodated in the property. Decorated with antiques and classic furnishings, this double room features a Greek marble bathroom and a shared veranda with views of the volcano and the Aegean Sea. For security reasons, only children older than 6 can stay in this type of room. Please note that due to safety reasons children can not be accommodated in this room type. This room is decorated with antiques and classic furniture. 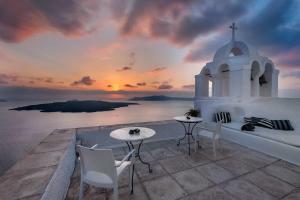 It has a Greek-style marble bathroom and a shared veranda overlooking the volcano, the sunset and the Aegean Sea. The Voreas exclusive mansion offers stunning views of the northeast part of the caldera. It has a private entrance, a private terrace with views of the volcano and the sunset, 2 double bedrooms with a pillow menu, 2 Greek marble bathrooms and a spacious living and dining area. It is decorated with antiques and classic furniture. For security reasons, children can not be accommodated in this room type. This secluded mansion, overlooking the volcano and the Aegean Sea, is located in the northern part of the complex and offers absolute privacy. The mansion has a traditional decoration, has a private entrance and is very well located to visit tourist places of Fira and the Prehistoric Museum of Thera. 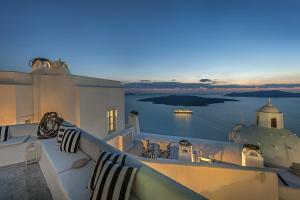 This unit has a balcony with views of the Aegean Sea and the volcano. It has a classic decoration, according to the environment of the Cyclades. This accommodation is located next to the old 18th century Orthodox cathedral. It consists of 2 houses with a barrel vault, cave house type. 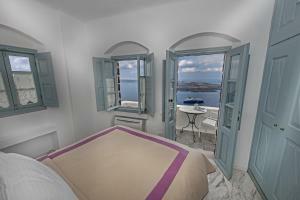 The houses are built on the cliffs and open onto a shared terrace with views of the volcano and the Aegean Sea. This suite is decorated with antiques and classic furniture. 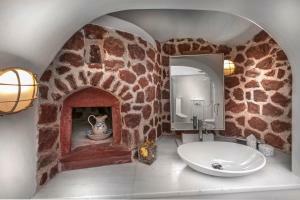 It has a Greek marble bathroom and a private balcony with views of the volcano and the Aegean Sea. This house of 2 plants offers views to the northeastern part of the caldera and has a large private terrace overlooking the volcano, the sunset and the beautiful church of the eighteenth century. It consists of 2 living areas, one on the 1ª floor and another on the ground floor with a large living room, as well as large bedroom and 2 bathrooms, one of them with Greek marble. It is decorated with antiques and classic furniture. This quadruple room has an electric kettle, seating area and minibar.